And the vacancy rate just hit a 25-year high. It's never been a better time to rent in Calgary, but it's coming at a cost to landlords. A recent report published by a Calgary real estate company has found that close to 40 per cent of private rental units currently listed in Calgary are sitting empty. Using data from Kijiji, RentFaster.ca and its own operations, Hope Street Real Estate Corporation found that there are currently 8,102 rental properties listed for rent in Calgary, and 37 per cent of those properties do not have a tenant living in them. "Times are hard for every single landlord with whom I’ve spoken in the past eight to 12 months. Empty rental properties abound and no obvious solution to the province’s empty rental property phenomenon exists," Hope Street CEO Shamon Kureshi said in a press release. "I have never seen it this grim before." "I have never seen it this grim before,” Kureshi told Postmedia. The Canada Mortgage and Housing Corporation (CMHC) says that Calgary's apartment vacancy rate has hit its highest level in 25 years, affected by a weak labour market caused by the oil downturn. In October, the vacancy rate hit seven per cent – up from 5.3 per cent in the same month last year. "In Calgary, we've had some pronounced job losses. Migration and population growth have also slowed down, which are usually key drivers in terms of housing demand," Richard Cho, principal of market analysis for CMHC, told CBC News. "We've also seen an increase in rental supply in the market as well. That's also contributed to a rise in the vacancy rate." 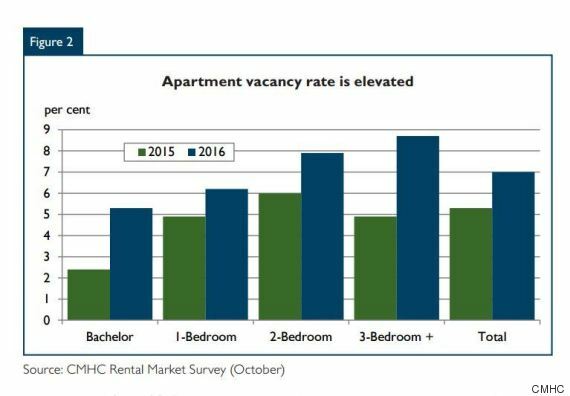 In better times, Calgary's vacancy rate sat at around three per cent. Rental prices are going down, as landlords try to fill their units. According to CMHC data, a two-bedroom until was renting, on average, for $1,258 in October 2016, compared to $1,332 a year earlier. In addition to lowering rent prices, more landlords are offering incentives – such as renovations, reduced damage deposits, or gifts – to attract tenants. 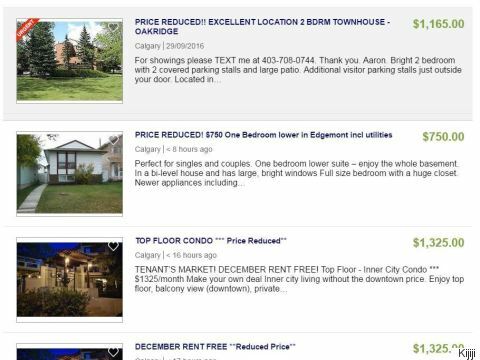 A screengrab of Calgary Kijiji rental listings offering incentives and reduced prices. While Hope Street's data focuses primarily on rental data for private landlords (people who own one to three residential rental properties that often include basement suites or laneway rentals), the CMCH data looks at investor-owned condo buildings and large rental buildings owned and managed by companies.